I recently read Scarlet Widow by Graham Masterton and I jumped at the chance to put some questions to this well known author. 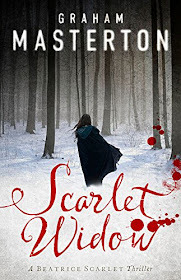 You can read my review of Scarlet Widow here and you can buy the book for yourself from Amazon by clicking here. Q: Can you tell us a little about Scarlet Widow, the first book in the Beatrice Scarlet series? A: Scarlet Widow opens in London in the mid-18th century. The heroine Beatrice is the only daughter of an apothecary, and her father teaches her all he knows about medicines and other scientific experiments. When her parents both die, Beatrice goes to Birmingham to live with her aunt, where she meets the boy who she will eventually marry. He becomes a preacher and is appointed to take care of a parish in New England. Beatrice, being an obedient wife, goes with him. Not long after they have arrived, however, the animals of local farmers begin to die in mysterious circumstances. Beatrice’s husband and most of the local populace believe that it is the work of Satan, but Beatrice, with her knowledge of chemistry, begins to suspect otherwise. Q: What was your inspiration for Scarlet Widow and what made you set it in America? A: To be totally honest with you, I don’t know what inspired me to write it, except that I thought that the idea of an 18th century CSI was quite entertaining. Ever since my days as editor of Penthouse magazine I have been interested in women’s thinking and their role in society, and Beatrice gave me a good opportunity to write about a woman who was brought up to be obedient but at the same time was characterful and strong. I wanted to set it in New England to get that Salem Witch Trial atmosphere and also because I know New England well (and once almost bought a house in Connecticut). Not only that, I wanted to show that the goodwives who emigrated to New England were enormously hard-working and supportive and without them America would not have developed as quickly and with such prosperity as it did. They had to do everything: cook, clean, look after animals, help with the crops, sew and knit and make clothes, and at the same time have children and bring them up. Many of them were well-educated and could read and write and some were kidnapped by Indians so that they could write letters on behalf of the tribes to the colonists. Q: Beatrice Scarlet is not your first female protagonist as your Katy Maguire series received rave reviews; why do you choose to write with a female lead? A: I have written many novels with female protagonists, such as Lady of Fortune about a woman banker, Maiden Voyage about a girl who inherits a shipping line, and probably my favourite Trauma, about a woman crime-scene cleaner whose job and whose collapsing marriage almost drive her insane. I find it very challenging to write novels from a female point of view, but it gives me the added advantage of being able to describe my male characters through their perceptive (or sometimes besotted) eyes. When I was editing Penthouse I spent a lot of time getting to know the girls who appeared in the magazine and finding out what their ambitions were and how they coped in a world where most men would just look at them with their tongues hanging out and not care about their personalities or their anxieties or their self-esteem. Q: Scarlet Widow delves into some weird and wonderful potions and remedies; how long did it take you to research? A: Bloody ages. I don’t think I realised what I was letting myself in for. Every single tiny detail of everything needed intensive research. Food, drink, church services, housing, hygiene, transportation. The fact that everybody in England had to be buried by law in a woollen shroud to support the wool industry. The number of undergarments women wore (and didn’t wear…no knickers in those days!). There were many familiar acids and alkalis and other potions around in the 18th century but most of them were known by totally different names. Q: Who is your favourite character in Scarlet Widow and why? A: Of course it has to be Beatrice. I so much enjoy writing about the conflict between her natural feistiness and her respectful behaviour towards her husband and towards the church and her community as a whole. Q: There are some disturbing and shocking scenes in Scarlet Widow, especially towards the end; how do you decide how graphic you need the scene to be versus how much should be left to the reader's imagination? A: I could write a book about this alone. I have written some very graphic scenes but murder and sexual assault are horrendous and there is no point in being coy about it. You can read much more graphic accounts of butchery every day in your newspaper…the only difference being that I make readers feel as if they are witnessing it first-hand. I know many people enjoy what they call “cosy crime”, where the worst thing that happens is that the bishop gets beaten to death with a badger in the bathroom, but I wanted to face up to the true horror of taking somebody else’s life. Graphic horror has to be very well written and I have several times experimented with taking readers right to the very edge in order to test my own writing skill. My short story Eric the Pie had the first issue of the new horror magazine Frighteners banned by the retailer WH Smith. Then there was a Cemetery Dance chapbook Sepsis (woman eats dead cat) and another extreme Cemetery Dance chapbook is on the way…Cheeseboy. Q: You're well known for your horror books; what made you move from horror to crime writing and which genre do you enjoy more? A: Crime has a much wider audience than horror but I think I have managed to keep all of my horror readers with the Katie Maguire novels, simply because death in the real world is just as grisly as death in the supernatural world. I am still writing horror. My story The Greatest Gift appears in Grey Matter’s new anthology Peel Back The Skin and I have a new horror novel in mind to write this year. The reason I wrote the first Katie Maguire novel was that my late wife and I were living in Cork in Ireland at the time which is an extremely characterful city and I realised that very few writers had ever used it as a setting. I enjoy writing in all genres. I am just about to write a new family saga in which nobody dies. Q: You can consider me in the queue to read the next book, so can you give us a hint as to what's next for Beatrice Scarlet? A: The next Beatrice Scarlet will be set in London, and involves a bit of witchery. Well I certainly can't wait for the next instalment in the Beatrice Scarlet series. Thank you very much to Graham Masterton for answering my questions and to Blake Brooks from Head of Zeus for giving me the opportunity to interview such a well known established author.